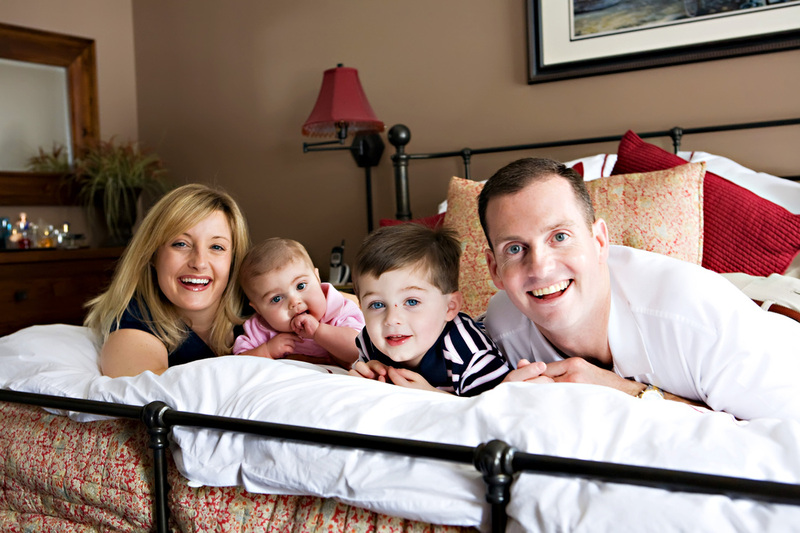 The Akin Foundation was started by Justin & Kristin Akin after losing two of their little boys to HLH. 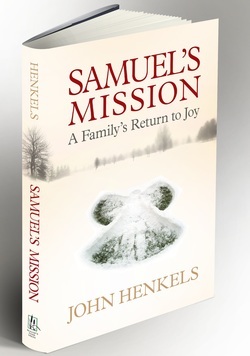 Following their tragic losses, they have found a way to direct their love for their sons into this heartfelt foundation built to help others. Justin Akin will soon lead another 700 mile bike ride to raise awareness for HLH. 1. When was the Akin Foundation first established? Why did you start this organization? 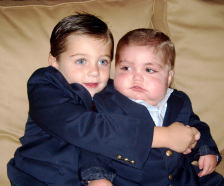 The Matthew and Andrew Akin Foundation was established in 2010 shortly after Matthew's death. Andrew had already passed away in 2009 and we knew we had to do something in memory of our sons to help make a difference in the future. 2. What is the mission of the Akin Foundation? How has it grown over time? The mission of the foundation has changed over time but the key component has always been and will be to help families diagnosed with HLH. The current mission is to support the HLH Center of Excellence at Cincinnati Children's Hospital and their four core priorities of Research, Awareness, Clinical Care and Family Support. When we started the foundation, the HLH Center of Excellence didn't exist. I'm on the Parental Advisory Board for the HLH Center of Excellence so that is a big reason we are funneling our money into the center and working closely with the HLH experts on where to actually spend the money. 3. Can you tell me about the work your organization does and the program or programs you run? 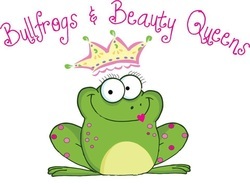 Our foundation really has a myriad of projects. We hold two blood drives and at least one bone marrow drive each year. We also travel to various hospitals and medical schools around the country and give speeches about HLH. In fact, we've been asked to give a speech at Washington University Medical School next month. In 2012, we donated 5 mobile therapy carts to the Music Therapy, Occupational Therapy, Speech Therapy, Physical Therapy and Child Life Departments at Cincinnati Children's Hospital. Each of the carts were filled with toys to help the therapists perform their jobs on a daily basis. Our organization also gives out a scholarship each year to a histio survivor who is graduating high school and going off to college. When a newly diagnosed child with HLH checks into Cincinnati Children's for their bone marrow transplant, a social worker from the hospital reaches out to us and we send them a Toys R Us gift card for the child with $100 loaded on it. My wife, Kristin, and I are also volunteer bone marrow couriers. So we travel around the country transporting marrow between donors and recipients. Needless to say, this has been very rewarding! We're also currently working with Cincinnati Children's Hospital to figure out long term stay options for HLH families. This has been a top priority for our foundation since its inception. 4.) What are the biggest accomplishments of the Akin Foundation? I truly believe one of the biggest accomplishments of our foundation is that we've helped save lives. For the past 3 years, we've purchased all of the keywords on Google associated with HLH. When newly diagnosed families are told their loved one has HLH the first thing they do is Google it. When they do, at the top of the page is the ad for www.matthewandandrew.org. In the ad it says "The world renowned HLH experts are at Cincinnati Children's Hospital." They then click on link that takes them to our website. From there, families either call or send me an email asking for help in getting their child to Cincinnati. I then help get them in touch with Paige Cripe, The HLH Center of Excellence Coordinator, who helps facilitate that process. Having families say "thank you" for getting their child to Cincinnati has been very rewarding. My goal all along was to get the hospital to start buying these keywords. Within the next month, this transition will finally take place. Another big accomplishment for our foundation is the book Kristin wrote, "Love Trumps Grief." It is the story of our journey with Matthew and Andrew and ultimately William, our adopted son who truly saved us. We've heard from friends, family members, strangers, doctors, presidents of hospitals, etc... that the book helped them in one way or another. The book has also opened many doors for us and provided a lot of opportunities to help make a difference. 5. )What do you think your constituents or beneficiaries would say is the best thing about your organization? I would hope they would say we've helped raise awareness about HLH and saved lives. I would also hope they would say we've inspired them. We've been through every parent's worst nightmare, twice. But we're moving forward and having good things come from the tragedy. 6.) What are your goals for the next three to five years? What priorities will help you achieve them? What barriers are in your way? Over the next 3 to 5 years, our goal is to help grow the HLH Center of Excellence at Cincinnati Children's Hospital. Being on the Parental Advisory Board, I have access to the Marketing Department, the Strategic Planning Department, etc... and even the President of the hospital who sits in on our meetings many times. Through the center, we will raise awareness about HLH, fund research projects and ultimately get a long term housing structure built for HLH families. Since we have the full support of the hospital, I don't see any barriers in our way. Kristin is also the only parent on the Leadership Committee at St. Louis Children's Hospital. Through that committee, she will help make a difference at hospital where we did not have a great experience. 7.) What is the 2013 HLH Ride for a Cure event ? The 2013 HLH Ride For A Cure event is a 700 mile bike ride over 7 days. It starts on September 28th and we will be riding from Natchez, MS to the front door of Cincinnati Children's Hospital. There are 6 of us riding this year. Every morning, we will be creating a YouTube video dedicating that days ride to a child at Cincinnati Children's currently fighting HLH. I think I'm most proud that Sean Feltoe, a 23 year old HLH/BMT survivor is riding with us this year. We'll end up at the hospital the weekend of the HLH Conference where doctors from around the country will be coming in to learn from the HLH experts. 8.) When did it first occur? How has it grown overtime? It started two years ago when the goal was to ride my bicycle from Amarillo, TX up Route 66 to Chicago, IL. Unfortunately, on day 2 I crashed and broke my shoulder. Last year, I went back to the site of the crash and rode the 700 miles back home to St. Louis. Another dad who had just lost his 5 year old daughter to HLH rode with me. With 6 riders this year, it is obviously growing. A videographer is coming along this year to film a documentary of our journey and to help raise awareness about HLH. 9.) How can our readers partake in this or future events? Our events calendar is located at matthewandandrew.org. Outside of the 700 mile bike ride, we have a 14 mile bike/ride pub crawl coming up that is a fundraising event, a blood drive and a trivia night/silent auction. 10.) Where can our readers donate or watch your progress? Readers can donate and follow our progress at www.hlhrideforacure.com. This is where the daily dedication videos are loaded each morning. Each rider's "Why I'm Riding" is also located on this website. This time last year we were contacted by a good friend looking to reach out to us because her neighbors' son had just been diagnosed with HLH. It wasn't too long after her and her husband had read the Philadelphia Inquire finding the article written on Eric and his drive to walk again and complete items off his bucket list. Weeks went on and Eric's health slowly improved and we became hopeful to meet little Sean over winter break. But Sean grew weary and he asked the doctor for an X-ray because he felt something wasn't right. 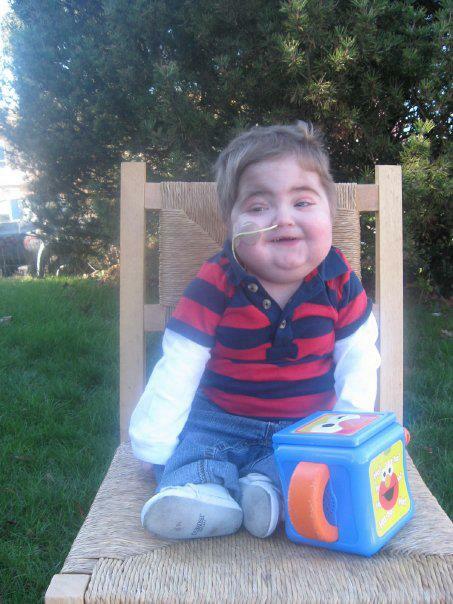 Sean had new complications developed and he went home to be with God on Sunday, January 6, 2013. Eric and I attended the services with such compassion and sorrow - awestruck over the power of love that was inside us for a little boy we never met. We were connected. Forever this little boy would hold a place in our hearts. So we ask our local friends and family to join us for the 1st Annual Sean Fischel Connect 5k (& 1 Mile fun run!) Sean has not only connected his family, but he has connected an entire school, sports teams, and hundreds to thousands all over the US with his kind heart and big smile. Connect with us. And remember to Connect with the ones you love because yesterday is gone and Tomorrow is never promised. This event has been created in honor of Sean Fischel, our 7 year old warrior whose light continues to shine and connect us through the love, support and hope of his community. All proceeds from this race will go towards the charitable purpose of supporting children's extra curricular activities within Moorestown. 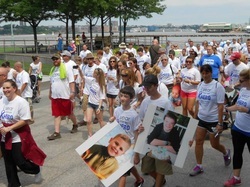 One mother's memory of her son's journey with Hemophagocytic Lymphohistiocytosis. Though 5 years has gone by, she still recalls every detail like it was yesterday. This is Anthony's story. Anthony was born February 20,2008 in Spokane Washington, He lived in the hospitals their most of his first few months, He was flown to Seattle Children's in May 2008 and because of his family's situation became a foster child....He sat in Seattle Children's fighting for his life and about 3 days after coming to Children's they discovered that he had HLH,and immediately started Chemotherapy, He was crossed typed for a BMT. The nurses and doctors became his family for 4 weeks. We had been wanting another Foster baby and their were many we could of chosen, Healthy ones, twins and one Named Anthony, I had kept asking about him and our Social Worker wasn't to keen on us taking him because he could die, I remember telling her...Don't protect us...He needs a Family...So we had it all set up so on June 27, 2008 John and I got to walk into Seattle Children's to meet this little tiny baby that we instantly fell in love with. 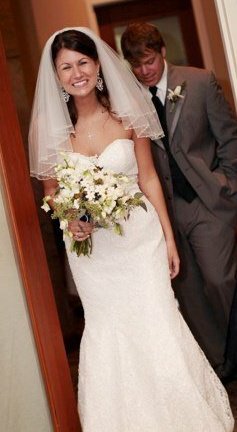 We started staying the night with him on July 1,2008.We would take turns and didn't know how this would all work out. Who would take care of our boys and Lindsay at home, But somehow I kept hearing ...I have this handled. We thought we were going home on July 5,2008 but Anthony got really sick and his electrolytes were totally out of whack and so we stayed in the hospital for another 3 weeks but were back in 3 days later. I remember the nurses smiling when we came back in..Just because they missed their baby!! !Anthony wasn't just our baby he was the nurses, cleaning crew, security and doctors baby. Anthony was in and out of the hospital with several infection over the Fall and Winter time. 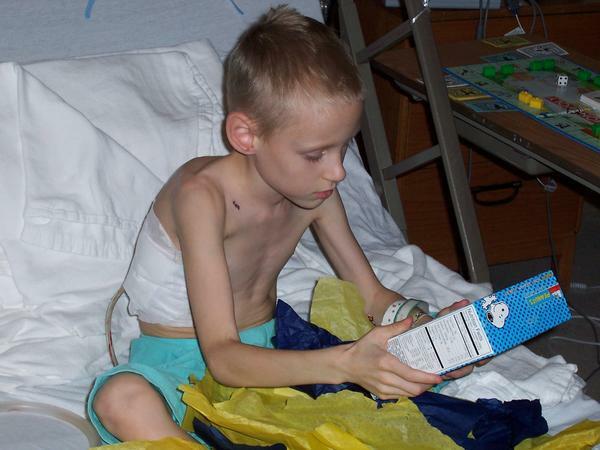 In November 2008 Anthony's Birth mom had given us permission to adopt him, It wasn't that she didn't love him but that she knew he needed the medical attention and we would do a open adoption with her. We spent hours on the phone, she would talk to him, we sent pictures, Christmas presents and she could still be apart of his life. So on May 14,2009 we adopted Anthony over the phone with the judge, He was too sick to travel to Spokane and we named him Anthony Wesley James!!! He was our gift from God and we now had to give him back to God. So in June 2009 he was dedicated by Pastor Deryl Bell and we had given our gift back to God. Anthony was suppose to enter the hospital for his Bone Marrow Transplant on June 23,2009 as always Anthony missed his nurses and he got really sick with a Blood Infection on June 22,2009. 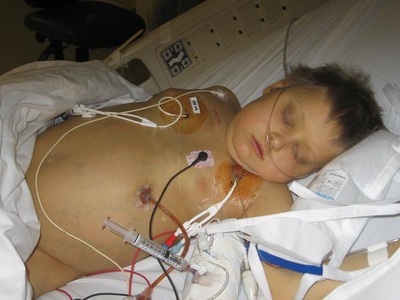 He cleared that and had received his Life saving transplant on June 23,2009. He was so sick and it wasn't easy watching the one you love fight so hard, He was finally HLH free and in full remission and we got to go home the end of August 2009. We would have many more blood infections and a lot of fighting what is called Graft vs. Host disease of the skin, and gut. He was always a fighter and we got to stay home for the holidays and most of the winter. 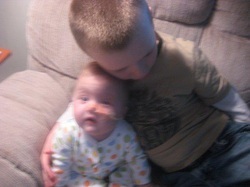 In March 2010 we were admitted for GVHD and were in the hospital for 4 months. In that 4 months Anthony had many many blood infections, and was in ICU for almost 6 weeks for clotting issues and we were told that we were going to lose him. The doctors called the top Hematology Dr's in Denver and they put Anthony on what we call a miracle drug Faraparonox.It meant a shot 2xs a day but it would keep Anthony alive. We thought that everything would be great and we would have a healthy boy to watch and raise. Anthony finally got to go home after 4 months in the hospital...He got his PIC Line out on Sept 9th 2010. On September 16th Anthony wasn't feeling well at all and as I was praying I looked in his eyes and said "God if he is tired its ok to take him" little did I know that I will never forget that prayer. September 19th would be the last time John would take him through the doors of Seattle Children's, We were in SCCA and they tried 11 times to get a line in him, they moved him to ICU and he went into Cardiac arrest in my arms. The doctors took him and worked on him for what seemed like eternity knowing that organs had probably had taken a beating and were shutting down. We went the next few hours not knowing if he would make it, we had family and friends coming to sit with us. We prayed and had our friends, family and Histio family praying that a miracle could happen. The words that no mother, father or sister should ever hear is there isn't anything more we can do for your loved one. The pain in the doctors eyes. They had all watched him grow up there. This wasn't the outcome we had all wanted. We moved Anthony down to SCCA floor the next morning, His Amy gave him his last walk around the floor, We had a room full of family and friends as we took him off the venilator.He was on his own timing as he was told to fight for 2.5 years. He lived for another 6 days. On September 29,2010 at 12:56 am Anthony earned his Angel Wings. Our nurses and doctors were great and as we said good bye to what was our home for 2.5 years, it didn't feel right leaving without our baby. He was suppose to live forever but God had other plans to heal him. Anthony was our gift for 2.5 years and to this day there isn't a day that I don't think about him, Wish he was here with us running around playing and laughing with his brothers and sisters. He showed us what Love is and how to love unconditionally. There are many times I wonder if I would take such a sick child again and to this day I would say Yes with no hesitations. Anthony was here for just a short while but in that short time, he touched so many lives here and around the world. Thank you Anthony Wesley James for letting us be your earthly parents and when I get to Heaven, we will play, laugh and be together but for now your brothers, sisters and other babies need me!!! I Love you to the moon and back! Keep watching over us. 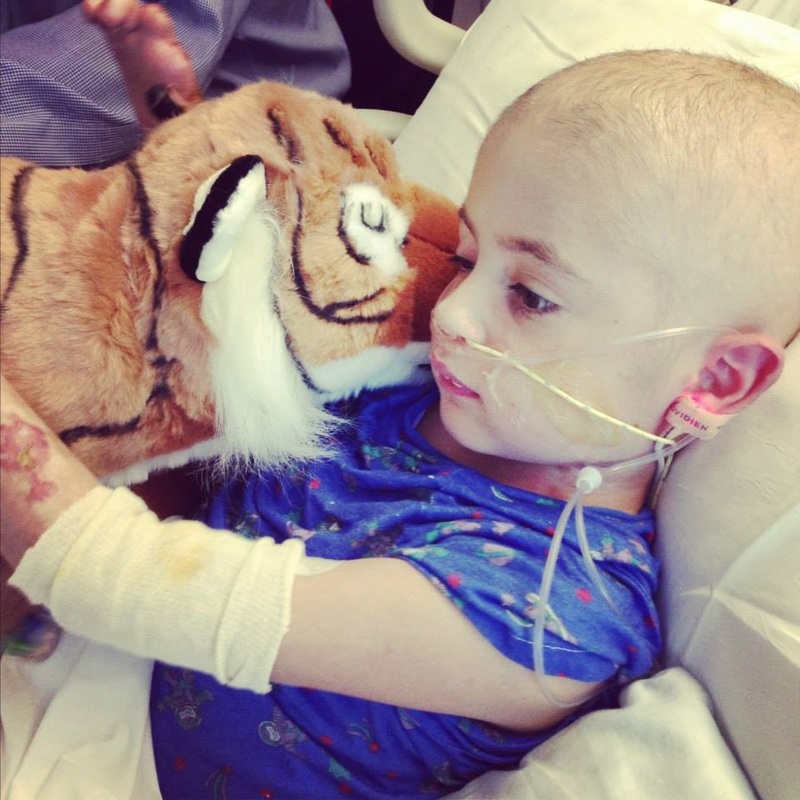 Tucker Scott was a little boy whose story stole our hearts for just a few short weeks. His journey with HLH, though brief, will impact the lives of everyone he touched forever. Tucker Scott Brittingham was born August 1, 2013 in Kalamazoo Michigan to Jason Brittingham and Leeann Ford. 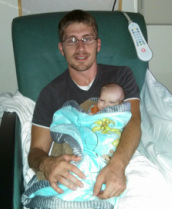 Tucker was thought to be in good health and went home as any baby would go home. Two days later Jason and Leeann took Tucker to his well check and immediately were told he had a fever and was septic and to go directly to the hospital. When at the hospital they admitted baby Tucker because they couldn't get his fever under control and his liver levels were ridiculously high. This was immediately a scary situation not knowing what was going on with him. They decided to do the spinal Tap to check for HLH. At that time Tucker was then put into PICU and put on a respirator and received blood transfusions high powered antibiotics and steroids. Days passed and results came back that he in fact had HLH . The testing poking and prodding continued until they just couldn't get anymore blood from this tiny 7 pound baby. 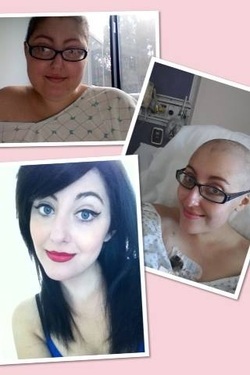 Chemo was started it seemed to be suppressing the HLH symptoms. He stayed stable for a week or so and then everything just went downhill again. He couldn't receive his chemo and his blood cell counts were low. The steroids were backed off and things took a turn for the worse. An infection took over they then found out Tucker had blood clots The only way to treat them was with blood thinners. Any other time they poked him, he would bleed at a very fast rate. 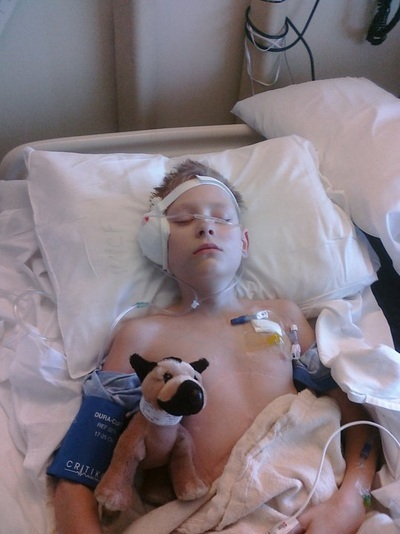 The hospital then decided to transfer Tucker to Cincinnati Children's Hospital in hopes of better treatment. Baby tucker was flown to Cincinnati and his condition worsened to the point that his liver and kidneys shut down and all hope had disappeared. Jason and Leeann had to make the most heart wrenching decision ever. 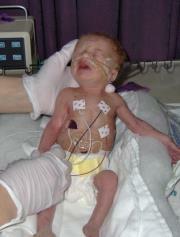 They had to decide that nothing was going to save this precious baby and decided to remove all of the tubes and wires. 30 minutes after making the decision, Baby Tucker passed away on August 30 2013 . They held him tight and loved him while he took his last breaths. This has broken there hearts, changed there lives and things will never be the same. The pain,the heartache, the guilt of not being able to fix him will forever haunt them and creates sadness and helplessness for the entire family. Tucker is a gift given to my brother and Leeann that we will never ever forget and he will always be in our heart. Now our goal is to let everyone in this world know that this disease affects people everyday and it needs better treatment options and a lot of awareness so that we as people can take this bad experience the worst experience ever and make it into a positive and try to save others! Tucker's Aunt Jamie had organized a donation site in August to help with medical costs in effort to help her family as she was several states away. 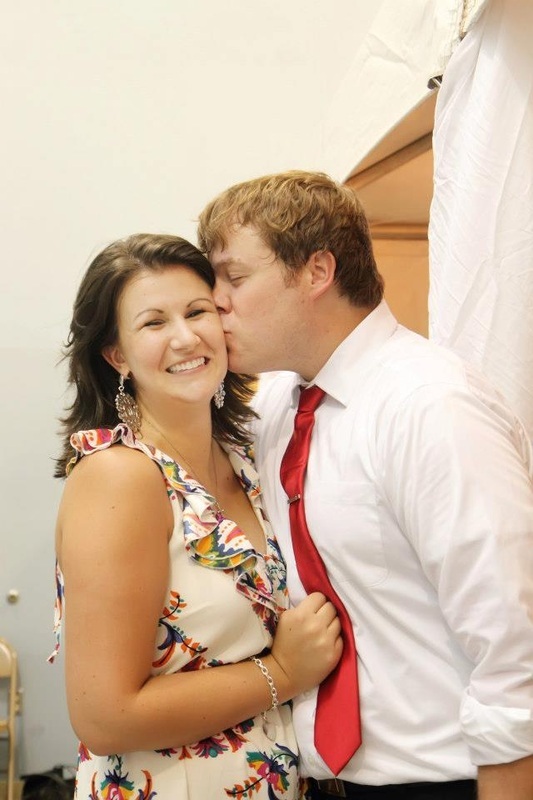 This site will now help Jason and Leeann tackle the large medical bills and Tucker's memorial service. No amount is too small. Donate below & don't forget to click LIKE on Tucker's Facebook page to help raise awareness for HLH.